Christmas is sneaking up on me quicker than I care to admit, but the other day, J pulled out my Christmas piano book, asking me to play some Christmas carols for him. I guess he's ready to get into the spirit of the season. So to fulfill his interest, I came up with this simple Christmas themed light table activity. It took me only a few minutes to set up, but kept both boys busy for an entire afternoon (and I'm sure many more afternoons to come). I first arranged some colored glass stones on a clear overhead transparency into familiar Christmas shapes: a candy cane, a wreath, a Christmas tree, and some holly. I then drew the pattern on the overhead transparency using colored permanent markers. I also included a literacy component by writing the name of the item on the transparency as well. 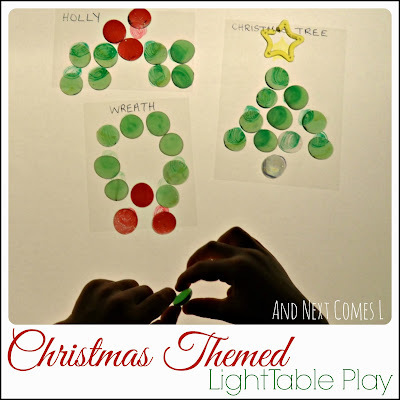 You'll notice that I used a star for the top of the Christmas tree (the star shapes were also used for this light table constellation activity). A glass stone could be used as a substitute if you don't have a star shape for the light table. Both boys were excited to try out this activity. J must have done these over and over like fifty billion times. Okay, maybe not that much, but you get the idea that he loved this activity. Even K was really into it. He was concentrating so hard, as you will see. He loved to point to the color he needed next, say the name of the color, and carefully place the correct stone. And here's what the designs look like when they are all completed. They look so pretty! So I guess this officially kicks off our Christmas celebrations! Thank you, Emma! I can't wait to see your Christmas posts.